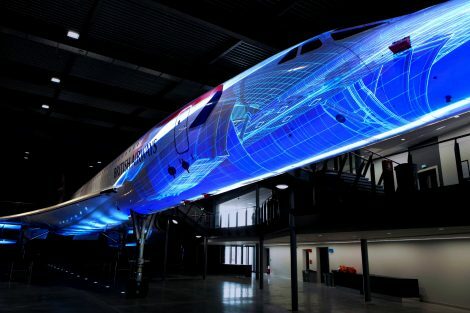 Unfortunately Concorde no longer takes to the skies, but the supersonic jet, which flew 60,000 feet above the Earth at twice the speed of sound, lives on in a specially constructed hangar at Aerospace Bristol in the United Kingdom, complete with a vivid projection mapping display thanks to Christie and Projection Artworks. 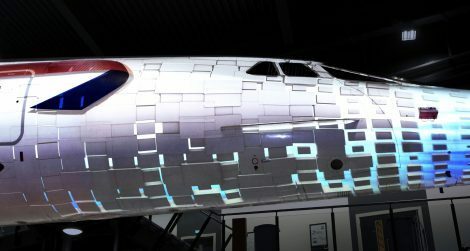 Using Alpha Foxtrot, the last of the Concorde fleet ever built – and the last to ever fly, for the backdrop, Projection Artworks selected four Christie D13WU-HS 1DLP® laser projectors for a unique storytelling projection mapping canvas. Using custom content that fuses iconic footage with exclusive interviews and graphical effects mapped on the right-hand side of the front fuselage, visitors embark on a 12-minute journey through the Concorde’s storied past from its design to the technical intricacies of the engine. Celebrities who flew on the Concorde are part of the visual voyage, as are flight paths and x-ray images, while the audio track features commentary from engineers, pilots and stewards who worked aboard the aircraft. This entry was posted on Friday, November 2nd, 2018 at 18:57 @831 and is filed under Scuttlebut. You can follow any responses to this entry through the RSS 2.0 feed. You can leave a response, or trackback from your own site.